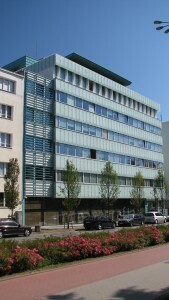 The Institute of Oceanography (IOUG) is a unique institution of higher education in Poland that has been training students in oceanography since the 1970s. The Institute is a unit of the University of Gdańsk, and is located in Gdynia. The IOUG staff consists of 150 researchers, technicians and PhD students, who work in the following disciplines: Physical Oceanography, Marine Biology, Marine Chemistry and Marine Geology. The Hel Marine Station located at the tip of the Hel Peninsula is also part of the Institute. IOUG is equipped with research vessel “OCEANOGRAF”. Our study programme offers courses for both undergraduate and postgraduate students. They can choose among the following pathways: Marine Physics, Marine Biology, Protection and Management of Marine Resources, Marine Ecobiotechnology, Marine Geology, Marine and Atmospheric Chemistry. The students get also practical training at sea on the institute’s boat and on research vessels of co-operating institutions. support of marine ecosystem management. The Department of Physical Oceanography of the IOUG contains four research sections: Laboratory of Sea Dynamics, Laboratory of Remote Sensing and Spatial Analysis, Laboratory of Marine Acoustics and Laboratory of GIS and Geostatistics. The physical oceanography group is engaged in study of sea hydrodynamics and physical properties of seawater and processes taking place in the coastal waters of the southern Baltic, particularly in the Gulf of Gdańsk. Satellite remote sensing methods are used to estimate physical and biological properties of seawater, the sea surface temperature, the surface chlorophyll concentration as well as to analyse such phenomena like coastal upwelling events or spreading of inland waters into the coastal area. The remote sensing techniques are also implemented for assessing solar energy reaching the sea surface and ice cover of the Baltic Sea. M3D is the hydrodynamic model with data assimilation of physical parameters (see Figure 2). This model runs as operational, assimilating sea level data observed by the net BOOS system in the Baltic, 3D distribution of T/S observed and recorded by net of buoys as well as the SST delivered daily by DMI. ProDeMo (Production and Destruction of Organic Matter Model) is the ecosystem part of the M3D model that has been developed and applied to the Baltic Sea. It describes nu-trient cycles, oxygen conditions and the parameterization of water-sediment interactions. The wind wave modelling by the use of WAM (Wave Model) was implemented in the Institute in 2000. Figure 3 shows the WAM forecast of significant wave height for the storm in February 2011. The operational wind wave forecasting system for the Baltic Sea and the Gulf of Gdańsk based on the WAM setup developed within the EU-research project HIPOCAS is under development in the Institute now. Recently, a coupled ocean circulation-wave model POM08 (Princeton Ocean Model 2008) is being implemented based on Mellor et. al. (2008). In recent years the Institute of Oceanography has been involved in several national and international projects. Among those related to operational oceanography were HIPOCAS (Hindcast of Dynamic Processes of the Ocean and Coastal Areas of Europe), ECOOP (European COastal-shelf sea OPerational observing and forecasting system) and currently underway: PROZA (Operational decision-making based on atmospheric conditions) and SatBaltic (Satellite Monitoring of the Baltic Sea environment). The task of the project PROZA implemented in IOUG is to develop a coupled wave-current model for the Baltic Sea and the Gulf of Gdańsk working in operational mode. The coupled wave-current nested models together with systematic routine measurements of the sea and atmosphere parameters will compose a basis of a hydrometeorological forecasting and warning system which is being developed within PROZA. The main aim of the SatBaltic project is to prepare and set in motion the technical infrastructure and practical operational procedures for the efficient, routine monitoring of the states of the Baltic environment. The task of IOUG is the production of maps of the sea’s structural and functional characteristics, including the temperature distributions, ice cover, and the dynamic state of the sea surface and the occurrence of upwelling.